I first came to Theodore Roosevelt National Park in November 2016. I had been on the road since September on an epic 6-month journey to photograph America. Being born and raised in Texas, I had never even heard of this wonderful piece of land. I first came across it in a National Geographic guidebook to the National Parks. The landscape immediately stood out to me. The colored layers of geological history etched into the hills were unlike anything I'd ever seen and made me eager to explore and photograph it. After my trip, it was clear that the park had left an impression on me. When people would ask me what my favorite places were, Theodore Roosevelt NP was always high on the list. It came as no surprise then when in November of last year I found myself applying for a job at the Theodore Roosevelt Medora Foundation. I think for myself I wasn't finished shooting the park. I love photographing this wonderful place and wanted to share with you guys some of my favorite places to take my camera. Wind Canyon is very likely the most photographed spot in the park, and with good reason. 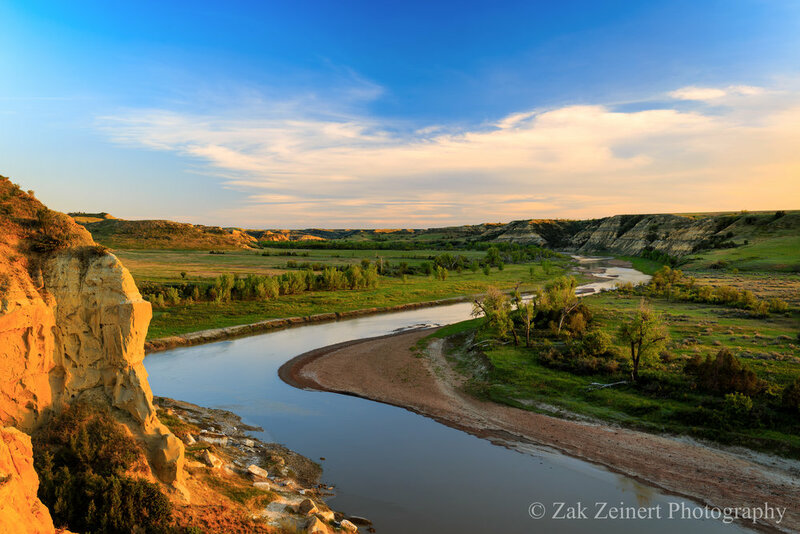 In the evening, the short footpath leads viewers to a stunning display as the sun sets over the Little Missouri River. The river makes for natural leading lines that photograph well and help guide the viewers eye to the fiery sunsets that frequent the horizon. I try not to shoot at the same spot too often, but I can't help but find myself returning to Wind Canyon. The 36-mile loop and numerous trails offer plenty of great sights, but don't forget about the opportunities back at camp! On my first visit in 2016, I was often greeted back at camp by a bison wandering by. That same evening, I photographed wild horses on the southern end of the campground. Not to mention the great selfies you can get for your Facebook and Instagram Pages as you gaze out upon the badlands from camp! Many of the park's visitors only ever see it from the safety of their vehicle along the 36-miles loop. Fortunately, there are many great photo opportunities along the whole stretch. I recommend driving the loop in the early morning or late afternoon. 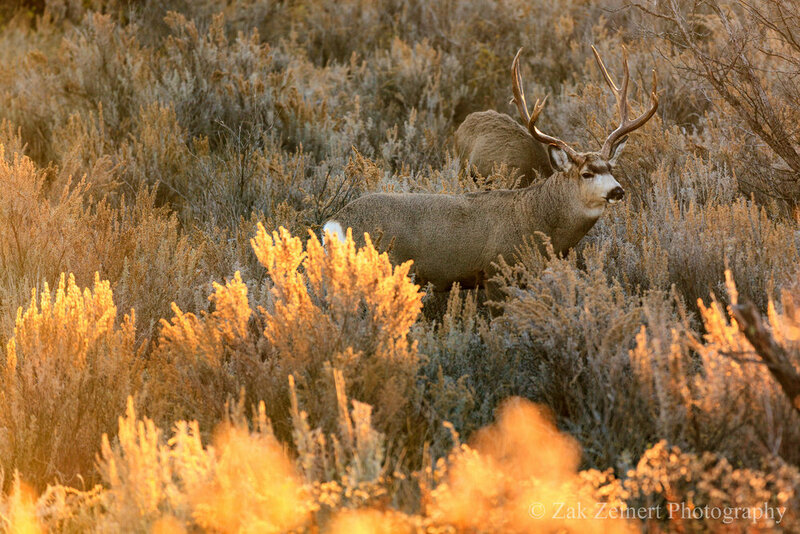 Not only will the warm golden hour light make your photos look stunning but the cooler temperatures will also draw the wildlife out. When you feel like getting out and stretching your legs, check out some of the incredible overlooks along the loop such as Boicourt or Scoria Point. The Petrified Forest Loop has quickly become my favorite trail in the park. Inaccessible via the 36-mile park loop, to reach the trailhead one must take exit 23 off of I-94w then continue up West River Road for roughly 6.5 miles. Don't let the bit of extra effort discourage you though, visitors to this trail are well rewarded. Besides being well maintained, the trail offers grand canyon views, peaceful sections of grassland, and of course the main attraction: petrified wood! The loop is about 10-miles long, but one only has to travel a short distance to find the fossilized remains of the ancient forest. 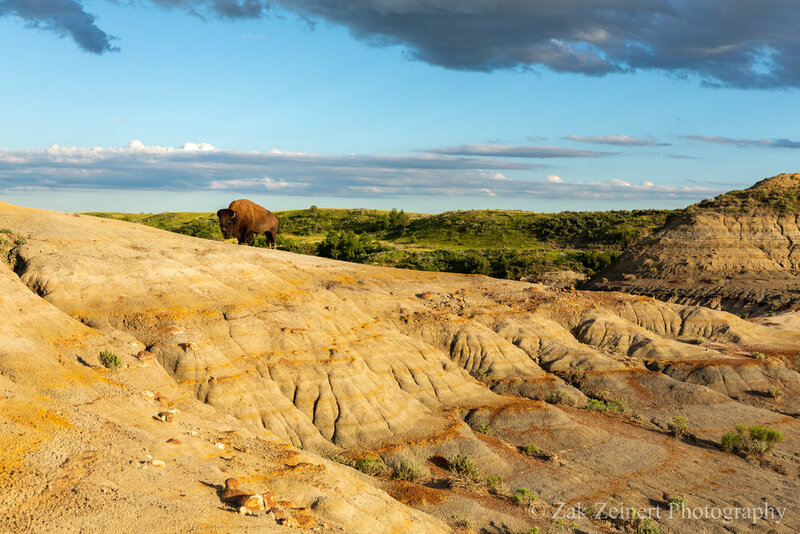 Buck Hill is the highest point in the park and provides grand panoramic views of the badlands. 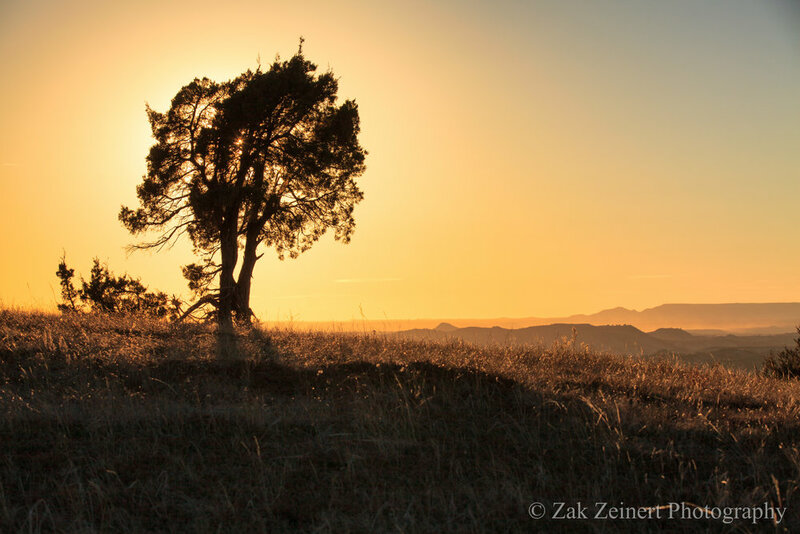 Lone trees are scattered among the hilltop and make for great silhouette shots as well as interesting subjects against the grassy terrain. The well defined trail winding its way down the southern slope provides an exellent backdrop for portraits while also being an interesting subject on its own. The Lower Talkington Trail will truly make you feel as if you've stumbled into another world. The painted hills seem to surround you as you descend into the eastern end of the park. Last time, I hiked it, I found myself caught between a cranky bison and a band of wild horses. I managed to get a some great shots while I waited them out from the safety of a hill top. 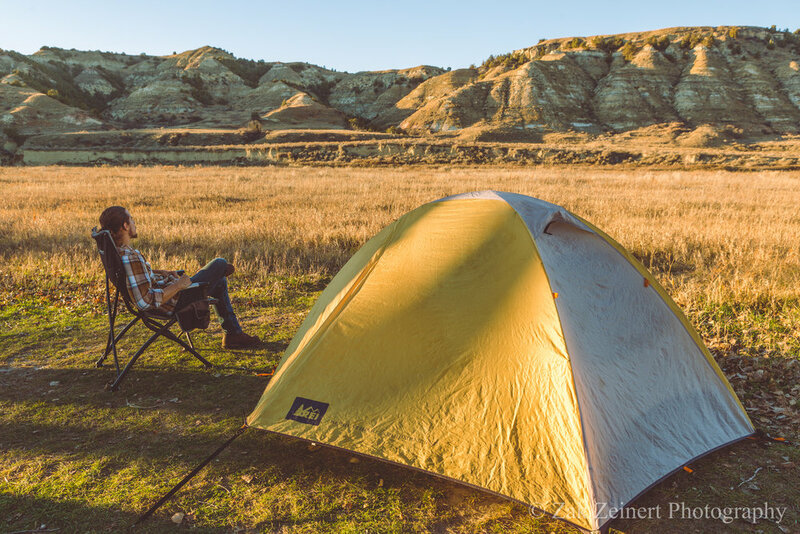 Don't forget to visit the North Unit of the park just south of Watford City. Not only is it just as stunning, but you'll deal with a fraction of the crowds that you get in the South Unit. 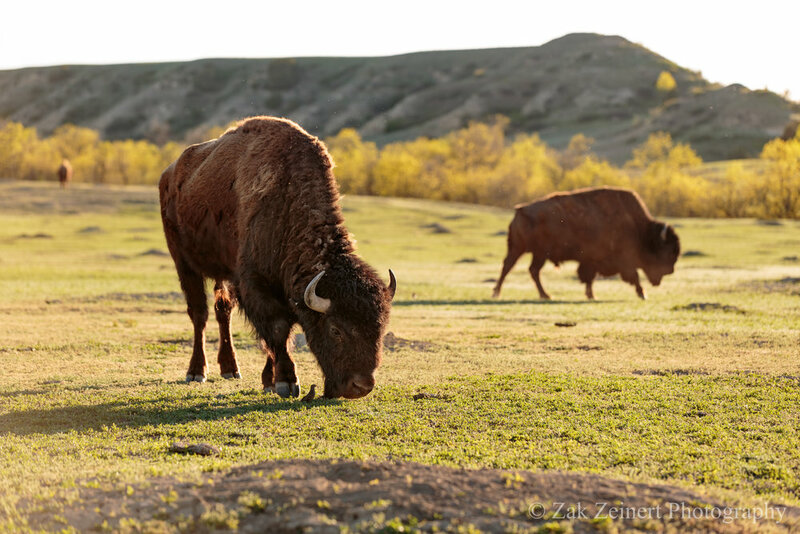 While you won't find prairie dogs or wild horses in the North Unit, you will find smooth, rolling grasslands more akin to what you'd see in Badlands National Park. 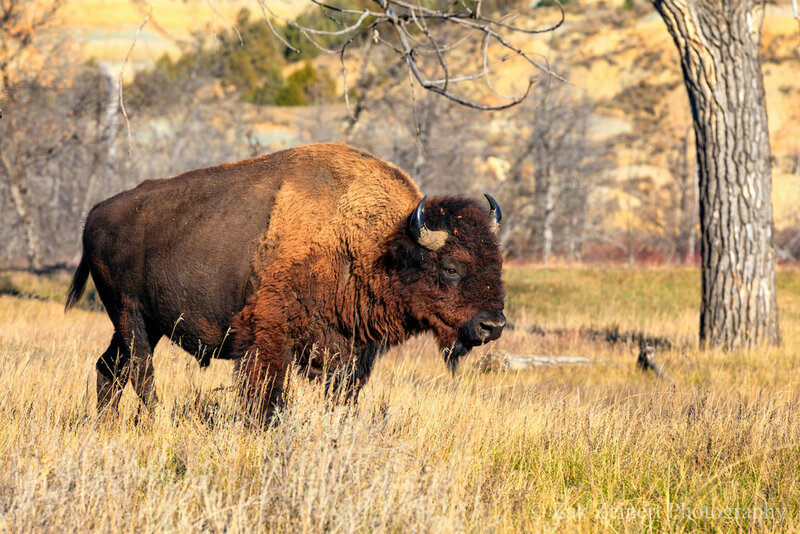 The buffalo are bountiful and the overlooks just as scenic. The in-and-out road, rightfully called 'Scenic Drive' offers many stunning views as it winds its way through the park.